ii) Calculate amortization expense by multiplying the above rate by the net book value (beginning of period book value of the asset). Note: We do not need the Salvage value calculation in these steps. As an example, we will consider the same scenario as from the Straight-line amortization method. Consider BB Company purchased a high-end computer on January 1st, 2004 for $15,000 and used it throughout its predicted useful life of 5 years, through to December 31st, 2008. The salvage value is expected to be $3,000. *Notice in 2007, we take $3,240 - $3,000 (Expected Salvage Value) and divide it by 2 so we can have a linear amortization rate of $120 for the years 2007 and 2008. This is because the maximum accumulated amortization must be Total Cost – Salvage. In other words, the minimum book value cannot be less than the salvage value, in this case $3000 because we cannot amortize an asset below its salvage value. ** As mentioned above, we expense $120 in amortization for 2008 so we can balance our ending net book value at $3000 (it cannot go below this amount). If in 2007 we had taken an amortization expense of $3,240 x 40% = $1296, our accumulated amortization would have been $13,056 and ending Net Book Value would have been ($15,000 - $13,056) = $1,944 which is below the salvage value of $3000. This violates the rule of amortizing below salvage value and thus we cannot use this method. 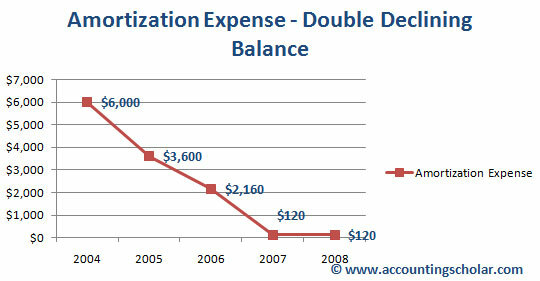 The above graph shows amortization expense using the double declining balance method. Notice in this method, the amortization is greatest during the first few years, with $6,000 amortized expense for 2004 and $3,600 in 2005 after which it drops off to only $2,160 in 2006 and $120 for 2007. Therefore, in the double-declining method, we see an accelerated rate of amortization done in the first 1 - 3 years of the capital assetès useful life. 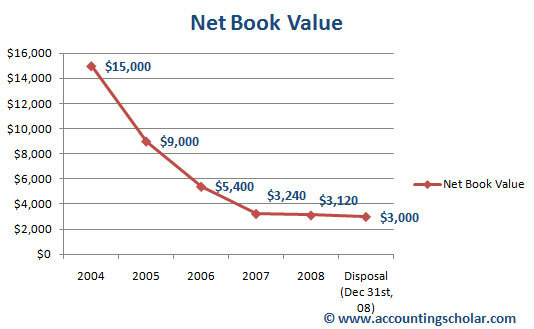 Using the double-declining balance method, just like how amortization expense is greatest in the first few years of the life of the capital asset, so is the net book value which steeply declines from $15,000 in 2004 to $9,000 in 2005, accounting for the $6,000 amortization expense recorded in 2004. The purpose of having these graphs is to show amortization theories & concepts in real life data and graphs, so that an accounting student can get a better understanding of the concepts.